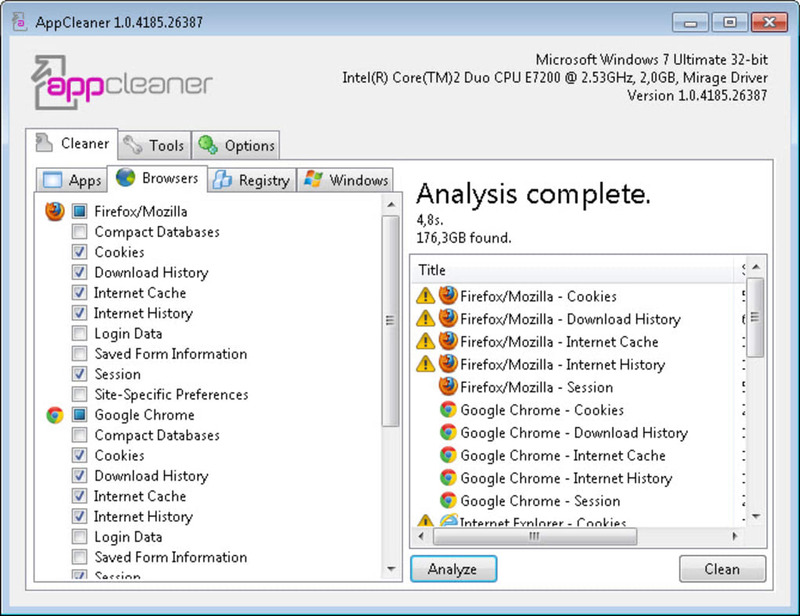 AppCleaner is a simple system optimization tool that features a bunch of quick cleaning and maintenance under one single window. Though AppCleaner doesn’t really include any revolutionary feature or any utility you can’t already find in Windows, it offers you an easier, more comfortable environment to access and use them. The interface In AppCleaner is divided into three main tabs: Cleaner, Tools and Options. 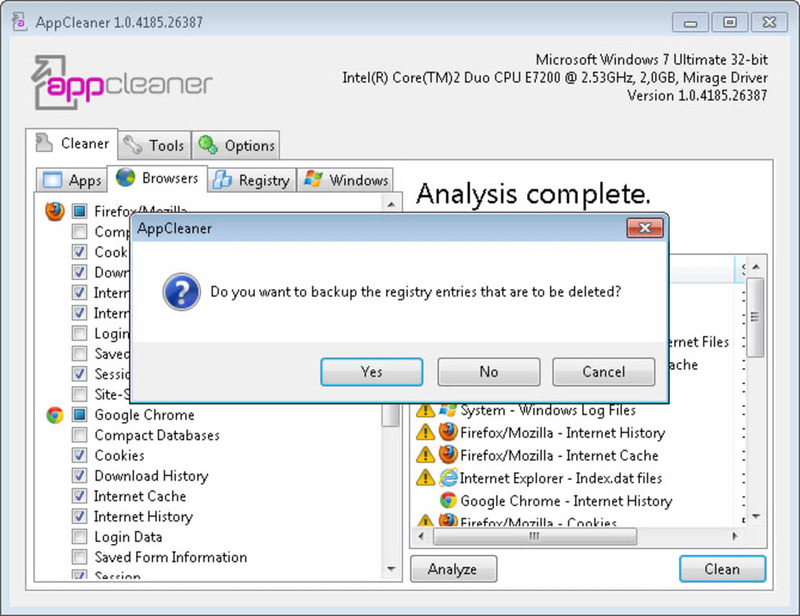 In Cleaner you’ll find four more tabs (Apps, Browsers, Registry and Windows) where you can select the elements you want AppCleaner to get rid of: browser cache and internet history, temporary files, lists of recent documents, invalid Registry keys and more. The Tools tab, on the other hand, includes utilities to uninstall software from your system and remove selected applications from system startup. Before you apply any changes, AppCleaner lets you create a backup in case the changes to the Registry cause any problems and you need to roll them back. If only the program let you add new apps to clean their traces, it would be perfect! 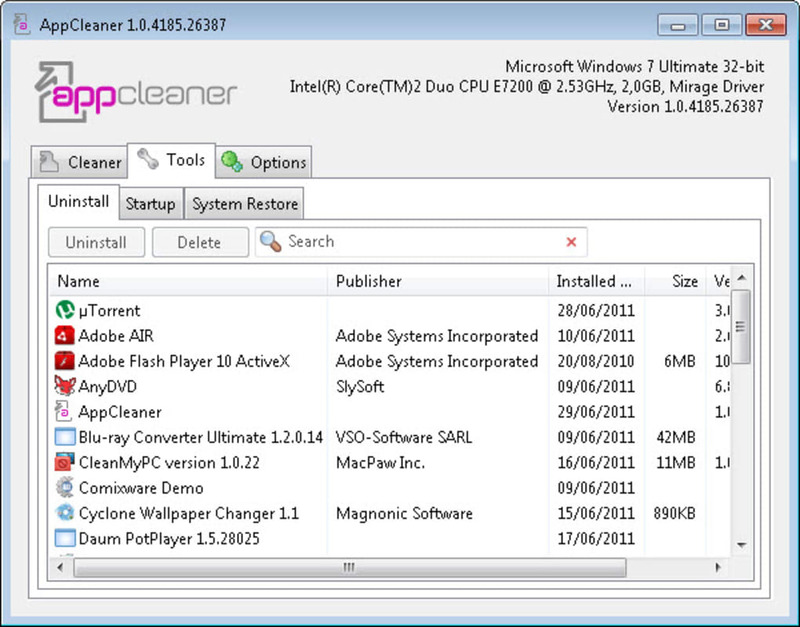 AppCleaner doesn’t include any revolutionary features, but it’s still a handy, easy-to-use utility with a bunch of cleaning and maintenance utilities for your system. Do not waste your time with this app since it does not "clean apps".. Simple. I have tested it and it does not work on Mac OS 10.9. Pros: nothing. it's simply a great app.. it's simply a great app. It's free and clean all file of the app. Very dangerous Software!!. This software has the potential to irreparably damage a machine running Windows XP, and MAY do damage to other operating systems also. In no circumstances would I recommend that anyone even TRY to load this program. It's potential for damage to a users machine is immense and the company that spawned it is no help at all. I would like to point out that I am NOT a newbee. I am a professional in the IT industry with over 30 years experience at a professional technical level. Most investigative tools simply do not work. SFC runs and says it corrected files, but there is no discernable improvement in the machine whatsoever. The only reasonable recourse at this time is to completely wipe and reload the machine - an exercise that in itself will take two or three days to complete. None, if you are using Windows XP. Damage to the O/S was so extensive that I refused to try it on any other machine or O/S. This program damaged the OS on my machine in ways that make any attempt to fix it extremely difficult. I can not copy or move anything unless I do so from the command line. My Network Connections were wiped out and I cannot re-install them. The Event Viewer loads, but I cannot open any individual event to see any of the details. System Restore no longer works. Restoring the registry did not help. Poor, dangerous software. Severely damaged Windows Installer service somehow. The backup will not fix the problem! Reinstalled Windows.